On a quest to learn more? Check out these event listings from AFP South Sound peer organization from around the region. View Advancement Northwest events (redirects to external site). Advancement Northwest offers many terrific opportunities to connect, learn and grow as leaders in the development profession. Choose from numerous events, trainings, and conferences. 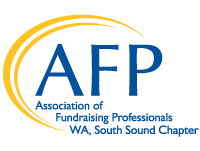 **AFP South Sound members can register for Advancement Northwest events at the member price. Follow this link to see the discount code. Login required. AFP Fundamentals Of Fundraising (All Levels): AFP Fundamentals of Fundraising offers a complete overview of fundraising, featuring the most current best practices. Ideal for individuals with zero to four years of fundraising experience. The two-day course is an engaging learning experience with case studies and hands-on projects. Essentials Series (Early Career to Mid-Level): These programs offer a solid foundation of best practices in philanthropy early in your fundraising journey and a helpful refresher after you've been fundraising for some time. Martini Monday (All Levels): After-hour facilitated networking gatherings featuring guest speakers who highlight a trending topic, followed by group discussions. Leading Edge Series (Mid-Level to Senior): If you are a mid-career or advanced fundraising professional, organizational leader, or volunteer, these deeper conversations with about strategic fundraising and management topics will meet you where you are. Northwest Washington Igniting Philanthropy Series (All Levels): This series is for fundraising professionals in Whatcom County, Skagit County, and the surrounding area to showcase engaging programs and resources for fundraising leadership in the Northwest. View Puget Sound Grantwriters Association events (redirects to external site). The Puget Sound Grantwriters Association (PGSA) promotes responsible, effective grantseeking and fosters connections among grantseekers, non-profits, and funders. The Lunchtime Program is held every month alternating between Seattle and Tacoma. PSGA members have free access to all meetings each year. The Funders Forum is an event where grantseekers personally can meet funders. The Seattle forum is held in spring, and the Tacoma/South Sound forum is held in fall. Specialized Trainings are workshops taught by experienced instructors. View South Sound Planned Giving Council events (redirects to external site). To provide a forum for communication and a clearing house for information about planned giving issues. To create and further an awareness of regulatory and legislative issues affecting the non-profit sector. To advance the education and professional expertise of SSPGC members. To encourage inter-disciplinary interaction of members and other allied professionals. To help enhance planned giving as a profession and provide mutual support to the National Association of Charitable Gift Planners, of which we are a member council. SSPGC holds monthly brown bag lunches in its members' offices. The purpose is to listen to a presentation made by a member and/or to hold a general discussion on one or more topics brought up by attendees. Any attendee may bring up any topic s/he wishes to discuss. Locations will be announced as the date approaches. Brown Bag Lunch meetings are held from 11:30 am to 1:00 pm at various members' offices. View Washington Nonprofit events (redirects to external site). As the state association for all nonprofits, Washington Nonprofits makes sure nonprofits have what they need to succeed. Washington Nonprofits holds events across Washington to help nonprofits learn what they need to know to achieve their mission. This includes workshops, webinars, and conferences. View Washington Planned Giving Council events (redirects to external site). The mission of the Washington Planned Giving Council (WPGC) is to increase the quality and quantity of charitable planned gifts by serving as the voice and professional resource for the gift planning community of Western Washington. The WPGC meets monthly in Seattle over lunch to exchange ideas and listen to presentations on various aspects of charitable planned gift planning. In addition, the WPGC sponsors an annual conference in Seattle that features local and national speakers, webinars through PPP, and Planned Giving 101 sessions.